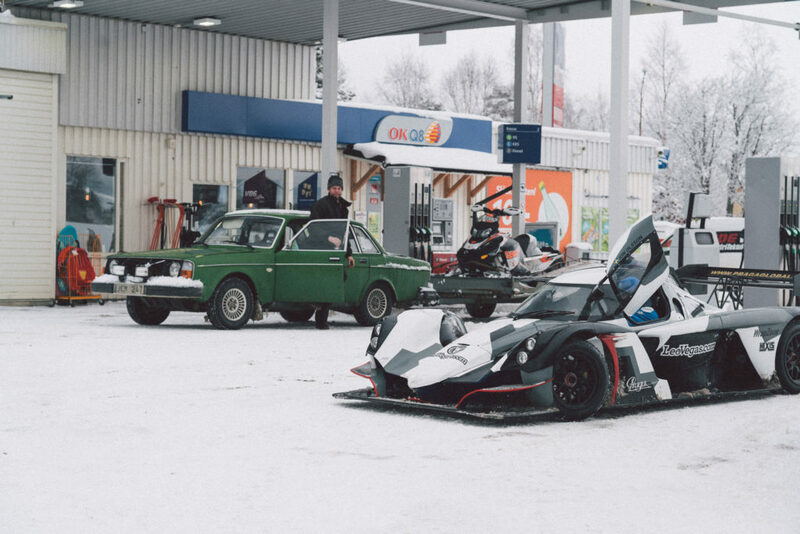 The Praga R1R gets cold feet. 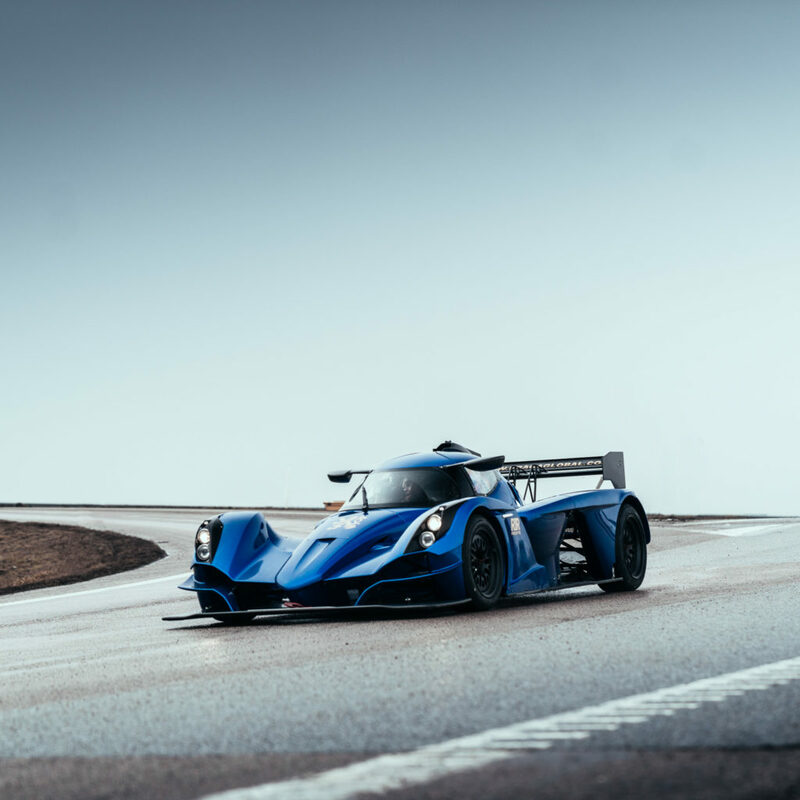 After a quick glance at the Praga R1R, many people would think that it is a pure-bred race car with serious compromises for the road. We at Praga Cars together with Jon Olsson have set out to prove this wrong. Back in December of 2016, Jon drove the car from Monaco to Marbella. 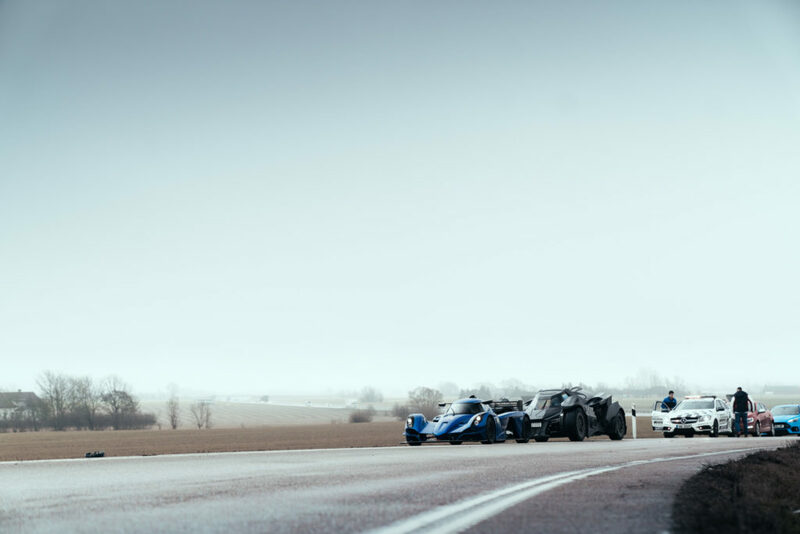 An 1800km journey covered in only two days and topped off with a day at Ascari where Jon set his personal lap record. Well, why stop there? The notorious Team Galag have organized The Snow Tour. A small rally consisting of close friends all sharing a passion for extraordinary cars. The rally starts in Copenhagen and would finish in Arvidsjaur where a two-day ice track driving event awaited. Arvidsjaur is a cool 1500km north of Copenhagen and often sees temperatures as low as -30˚C. It has become a haven for large car manufacturers to conduct winter testing of models ranging from super sports cars to luxury SUVs. 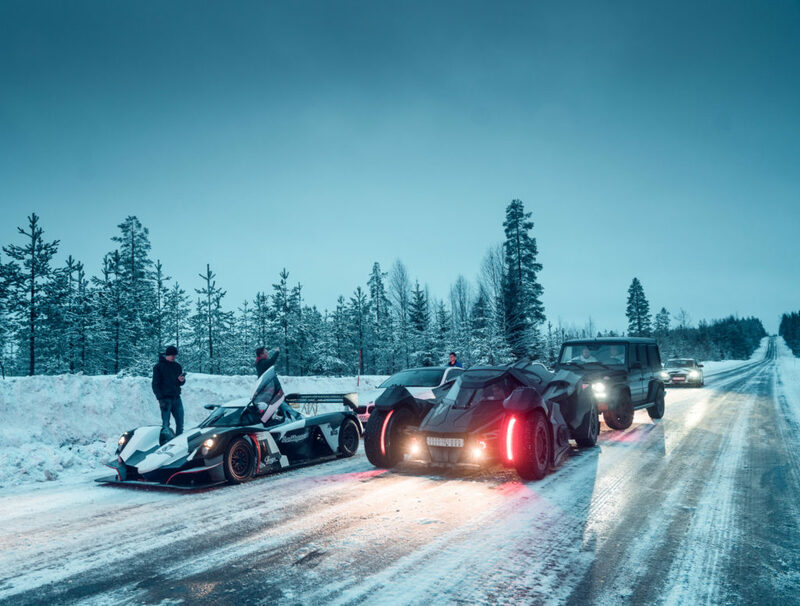 The grueling conditions of winter in Northern Sweden offer the opportunity to drive these cars to their limits and often beyond. Does this sound like the kind of place to drive a pure-bred race car? 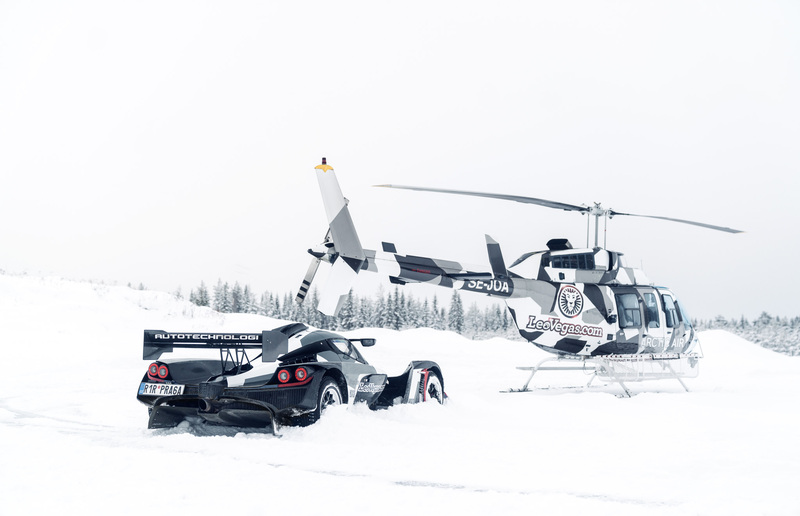 If you said yes, you may be Jon Olsson. The tour starts in Copenhagen. On the night of February 25th, the Bella Sky hotel in Copenhagen sees one of the most eccentric gatherings of cars you could possibly imagine. 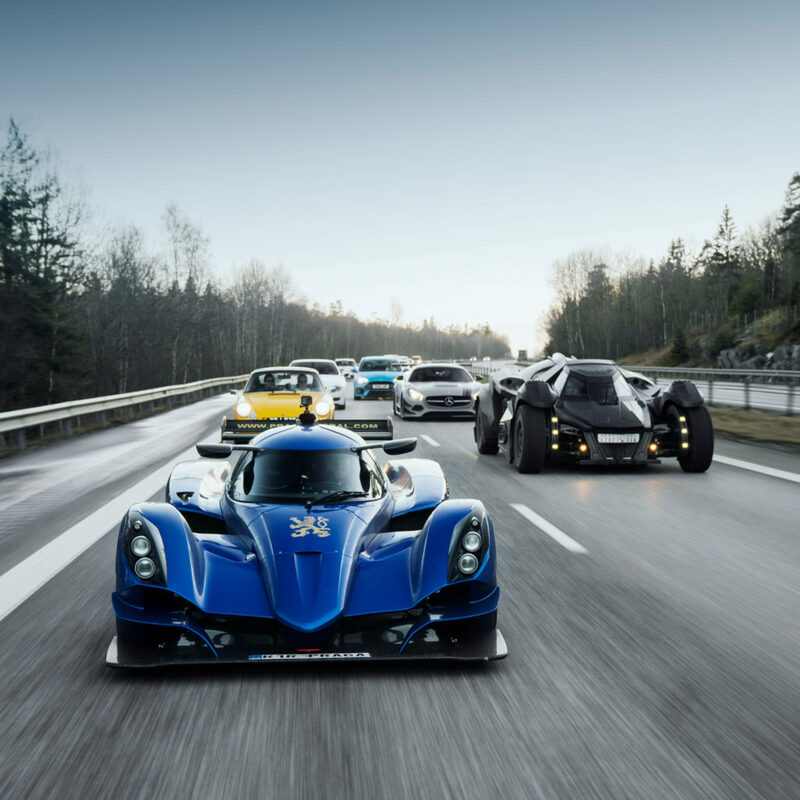 The Praga R1R is in good company. Joined by the Batmobile, a Mercedes AMG GT3, a classic Porsche 911, BMW M6 and a Ford Focus RS. The Praga is used to being the centre of attention whenever it shows up outside of a hotel, however, this evening it has competition. The harsh wind and rain make it almost unbearable to snap even a single shot of the line up at night, so it will have to wait. In the morning a crowd has gathered, thankful to see some slightly better weather. Jon jumps into the car, not before about 100 selfies with fans. With his previous experience with the car in mind, he has decided to wear multiple layers to keep himself warm. The convoy departs and makes its way into the Öresunds tunnel. Famously the tunnel/bridge that connects Copenhagen to Malmo. As you exit the tunnel onto what you expect to be Swedish land you find yourself on a bridge that appears to spawn from the ocean. The dark clouds barely cover the tips of the bridge towers. The forecast shows better luck ahead and everyone crosses their fingers. Checks across the Swedish border go surprisingly smoothly and the cars make their way up through the south of Sweden. We hit our first fuel stop around one and a half hours into the journey. Fuelled with both petrol and coffee the crew hit the road. Not knowing exactly where we are going everyone follows the cars in front of them and eventually make it to the lunch stop in Jönköping. A huge crowd has been eagerly awaiting the arrival of The Snow Tour. Despite only a single Snapchat sent from Team Galag giving away the exact location. People swarm the car as Jon comes to a stop outside the Bada Bing Burger joint. Many enthusiastic fans stay to chat with us about the car. Time passes and realizing we’ve been too busy chatting and haven’t eaten, we get into our cars and hit the road in search for the next place to get some food. As Jon drives the slightly mundane inland Swedish highways up to Stockholm, the sun sets. Yet again a crowd is waiting in suspense for the cars to arrive. Only some hours behind schedule the crew arrives one by one to the Berns hotel. Whereas the rest of the cars will spend the night outside the hotel the Praga has a date at Wrapzone. 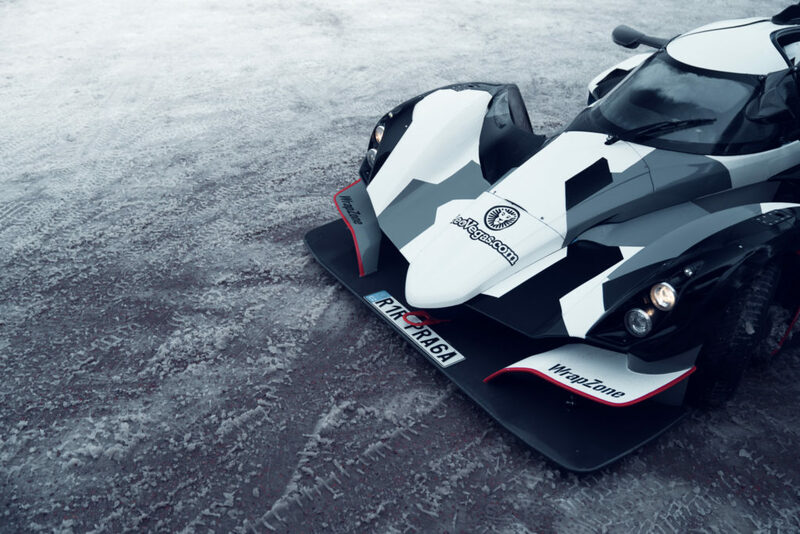 The signature Jon Olsson look is the notorious winter camo and a winter camo wrap for the R1R is long overdue. As the car gets a good clean in preparation for the wrap we wait for the wrapping team to arrive. Only to find out the “team” already has. One guy, Andreas, is set to spend an all-nighter in order to finish the wrap by the morning. The car may look small but the with aerodynamics as it’s key design factor it’s surface area is equal to that of an Audi Q7. With our skeptic hats on, we watch while Andreas does his work. Only one hour in and we are starting to think he may actually put this off. We, as opposed to Andreas, plan to get some sleep before our next stint en route to Arvidsjaur. In the morning we head back Wrapzone to pickup the car. Eight hours it took to wrap the car and it looks the business. Jon is super excited as he shows up to the hotel to see the R1R in its new clothes. To his delight, a young fan greets him with gifts. Not your typical gifts, rather Red Bull and a pillow. As he puts it “a pillow in the Praga is like water to a man in the desert”. He invites the young fan to join him in the Praga. We make our first fuel stop of the day where the ride for the young fan ends, we leave to our lunch stop hoping that Jon’s new found friend has some way to get back to Stockholm. Jon’s childhood home is the destination for the day’s lunch stop. A typically Swedish home in a typically Northern Swedish town. Mora, where Jon grew up and the place that made him the skiing legend that he is today. Hosting a group of crazy people and having a Batmobile and a race car parked in your driveway is not every mother’s idea of a family luncheon, but it’s something his parents surely have come to expect. Jon slides up to the house where the local kids are awaiting his arrival. The group is treated to a stack of pizzas and a Swedish “fika” or coffee and cookies. His dad shows us around the garage where the Olsson memorabilia is kept. Ranging from his very first pair of skies to his signature pro skies. Also in the garage is his dad’s Porsche 911, given to him by Jon complete with a Club Sport setup. He tells us he regularly does road trips in the car even driving to Monaco to visit Jon. Jon’s father warns us for the roads ahead. The narrow, icy and moose prone roads of Northern Sweden are less than ideal for a cavalcade of cars such as these. But then again, that’s kind of the point, isn’t it? The group makes it to Östersund with a thankfully uneventful trip. Though the road doesn’t get easier from here. Yet again a crowd waits at the hotel for the cars to arrive. Jon does his usual meet and greet with the fans and disappears to his hotel room. The following day comes with a much-needed lie in for Jon as the Praga is due to get some spikes. Yes, Jon drove all the way to Östersund without spikes. Dubbed tyres in our size are not easy to come by on late notice. However, we managed to find a guy here who might just have a set. We experiment with a few different sizes and eventually settle on a set. Despite being the smallest spikes possible for a road legal tyre they will stick better to the ice than where it was wearing before. We take the opportunity to get some spikes for the go kart also. Oh, did I forget to mention we have a go-kart with us? And not one of your runabout weekend rental karts neither. This is a Praga KZ1 top tier racing kart. A six-speed shifter, 55hp, 245km/h top speed kart. This may be the fastest and most fun of everything on the ice, but more of that to come. As morning comes and we prepare to hit the road once again. It’s clear that there is a new arrival to the group. Not a car though, rather a helicopter. In order to get the sickest shots on the road, a helicopter is a must have. The chopper tails the cars for an hour or so and after getting all the shots and needing fuel it falls back. The chopper and the R1R head off to do a short photo shoot. Our factory driver Tomas is instructed to drift the car around the chopper a feat that would prove challenging even to most experienced drivers. Tomas pulls it off first try and allows for some amazing photos. Batman may have super human powers, but running on diesel is evidently not one of them. This super-blunder puts the tour many hours behind schedule but spirits remain high in excitement for the days to come. As night falls so does the temperature. Not a problem for most of us. For Jon however, it’s no pleasure cruise. The words “I told you so” spring to mind as Jon reenacts his journey for us in the hotel lobby. He turned down our previous offer for electrically heated socks something he now regrets. Now warmed up, he notes it was the coldest drive of his life. With outside temperatures reaching -15 and the in-car heater turned off, it’s no surprise. Despite the cold Jon praises the entire team for building a car of this build quality, reliability and performance. The next morning the crew make the short trip to one of the many ice tracks in the area. What is normally an Audi Experience track is now hosting a group of cars like no other. We start preparing the kart. Filling fluids, mixing oil and gas for the two-stroke engine. Jon puts on the helmet and takes a seat in the kart. We give him a push start and off he goes. Seeing the Batmobile, R1R and kart simultaneously drifting the oval is somewhat surreal. On the oval, the R1R was not so eager to get any dramatic tail-waving action. Even Fredrik Åhlin WRC rally driver and the instructor for the day struggled to keep the back end out without spinning. The laws of physics simply won’t allow it. The extreme lightness of the car matched with the low speed and grip of the ill-studded tyres is not a combination that works here. However, it’s a very different story on the high-speed circuit. Here downforce comes into play, and play it does. Reaching speeds up to 200km/h on the ice the R1R has finally found its place up here in the North of Sweden. One by one the cars end up beached in the snow. So often in fact that we ran out of tow rope to pull the cars out. People are forced to dig the cars out by hand and shovel. As we near the end of the day the instructor has had enough digging for one day and after releasing a Q7S from the snow shouts “no more drifting we’re going home”. So that was the end of it. A six-day excursion crossing almost the entire length of the country. 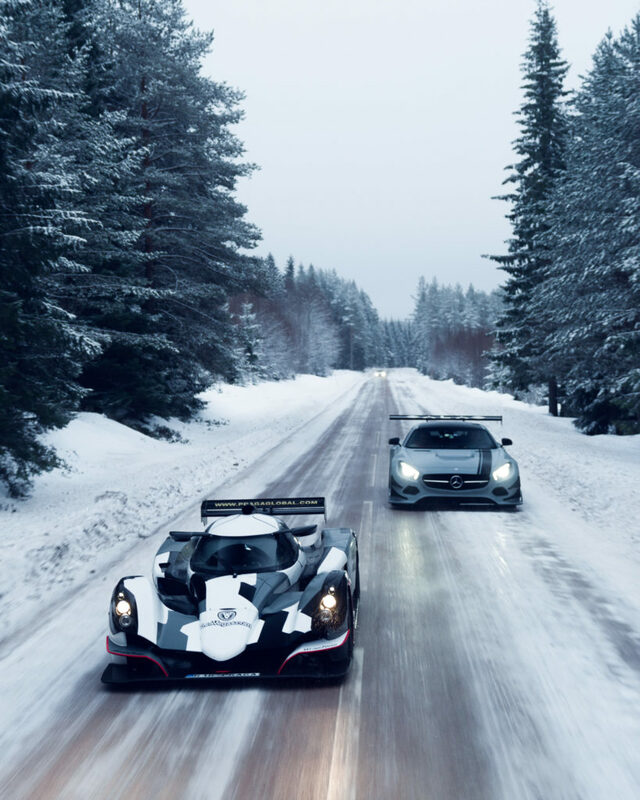 Both car and driver enduring the tough winter conditions in a car made for the track and both with an epic story to tell. The Praga R1R has conquered the North, but the list of places to drive is long and the R1R saga is far from over.